SDC models automatically place consumers of mental health services "in the driver's seat"2 by making them the primary decision-makers in choosing services and providers and by giving them authority over an individual budget. Although this structure supports consumers' autonomy and self-direction, it also demands greater consumer involvement in treatment decisions and care planning. Some consumers and family members could initially perceive this new role as undesirable or risky. As a result, offering education to consumers who may be interested in participating and providing various supports to participants once they start SDC may be essential to maximize participation in SDC programs. Supporting SDC participation among those persons who may be ambivalent about participating as a result of perceived risks is a critical task for the next generation of mental health SDC programs. Programs need to have a capacity to provide psycho-education about SDC. A trained SDC program representative or network representative (i.e., a SDC representative serving multiple programs in a geographic area) could serve in this capacity. Such a person would presumably make regular presentations at organizations in their communities, such as consumer advocacy organizations, family member organizations, and outpatient mental health programs. Programs could also develop and/or disseminate web-based and/or printed educational toolkits for mental health SDC. In presentations and in educational toolkits, testimonials from SDC participants could provide an effective tool for communicating the risks and benefits of participation. At present, few, if any, such tools exist, and consequently they would need to be developed with public or private funding. Supports for continued participant engagement in mental health SDC also may be needed. Participant disengagement (i.e., separation) from SDC is a concern for two reasons. First, some participants who disengage from SDC may effectively stop self-directing their own care, and as a result they may stop receiving needed mental health services. If such consumers are not self-directing their own care, some alternative arrangement for delivering services must be put into effect. Second, some ex-participants may not return to their SDC programs unless the programs actively re-engagewith them and invite them to return. For example, they may subjectively associate a sense of failure with their previous SDC effort, may not feel welcome to return, or may not know how to re-engage with the program. As a result, programs may need a capacity for re-contacting persons who become separated from SDC and a protocol for either re-engaging former participants in the program or re-directing them to another program or provider. In key informant interviews, consumer advocates pointed out that even after a consumer has started participating in a SDC program, a worsening of the consumer's health status may necessitate a hiatus of participation in SDC, although a return to SDC could occur after the consumer is sufficiently recovered. The SDC approach may not work well during an acute episode of psychiatric illness, when a participant's ability to make decisions that are consistent with his or her own interests may be impaired. Hospitalizations would also limit a participant's autonomy and ability to make decisions about their own care. There is not yet any consensus among SDC program officials or consumer advocates regarding how hiatuses of participation in mental health SDC, due for example to a period of acute illness, would be handled. Programs would need to address various logistical questions. For example, how would SDC program staff know whether a participant's mental health status and decisional functioning had declined to such a level that a participation hiatus should be considered? Programs could, for example, stipulate that participants must regularly check in with their coach, either by telephone or in person, and report on their mental health status. An unexpected lapse in scheduled check-ins could then serve as a prompt for program staff to investigate whether a client's status had changed. Newer reporting technologies designed for persons with SMI, such as video-based assessment, automated telephone questionnaires, interactive smart-phone reporting applications, or Internet-based reporting tools, could also be brought to bear in obtaining regular status reports from participants. However, a policy of requiring a check-in would seem to be somewhat contrary to the principle of self-direction. Also, it is unclear whether or how a reporting requirement would be enforced. Would programs be required to suspend participation for participants who do not regularly check in? Another logistical question concerns the temporary transfer of decision-making authority from a participant to a care entity when the participant is unable to self-direct care. The care entity could be the participant's designated mental health care provider or provider organization, such as a psychiatrist or mental health clinic. It is unclear how such transfers will occur and what safeguards will be put in place to ensure they go as planned and occur in a timely manner with minimal lag between the consumer's real-time decline in ability to self-direct care, notification of or recognition by the provider, and an administrative shift from SDC status to additional oversight. A process for following up with the provider/provider organization to re-assess the participant's status and determine whether the participant is ready to re-start participation in SDC would also be needed. An administrative tracking database for tracking changes in participants' mental status and a corresponding administrative process that ensures database updating will be needed to support temporary transfers of decision-making and hiatuses of participation in SDC. Stefan34 suggests that SDC participants should prepare advance directives, designate health care proxies, and execute durable powers of attorney to "ensure that there is never a vacuum of decision-making and control which forces the involvement of the legal system, the mental health system, or persons who are strangers to the client's situation and values." SDC programs could encourage participants to fill out advance directives and review them periodically. In addition, recovery plans should include a crisis plan that addresses other issues besides health care, such as housing, employment, and child care. Crisis plans could also include a list of current providers, so that the primary mental health care provider can be easily identified and contacted according to the participant's preferences. Other protections besides advance directives may be needed in order to maintain self-direction during periods of acute symptom exacerbation. One option could be to require case managers at all SDC programs. The case manager would be trained in the SDC approach and would be responsible for helping participants navigate transitions into and out of SDC. Smaller SDC programs could share a case manager with other programs in their region, while larger SDC programs could have their own case manager. Payment rates for the case manager position could be built into a state's Medicaid plan. SDC programs should be prepared to help participants compensate for cognitive and functional impairments that may impede them from self-directing their own care and engaging in a recovery process. In persons with mental health disabilities, cognitive impairments and other clinical problems can impede decision-making and the ability to complete daily tasks that are required for independent living, being employed, and participating in school and other social activities.29, 30, 31, 39, 40 In addition, results from at least two clinical studies suggest that persons who have more severe mental health symptoms and functional disabilities may have greater difficulty participating in recovery oriented services.41, 42 As a result, some consumers may be able to fully engage in SDC only if they obtain decision-making supports, skills training, or other assistive services that are designed for persons with severe mental health disabilities. Obtaining these supports may be challenging for mental health SDC programs. One key informant observed that some consumers transitioning from traditional services into SDC may initially not have the skills needed to fully utilize the tools offered by SDC. Persons with mental health disabilities have varying abilities to independently manage common activities of daily life, such as shopping for groceries and clothes, preparing meals, attending to personal hygiene, doing laundry, driving a car or using public transportation, managing medications, and keeping track of income and bills. Being able to complete "instrumental activities of daily living" (IADLs) is a lynchpin to recovery from mental illness,43 and clearly would facilitate participation in SDC programs. SDC programs must consequently be prepared to help participants gain access to providers of needed IADLs or to programs that provide skills training in completing IADLs. One of the threats to the success of mental health SDC is that IADL providers who serve persons with SMI may be unavailable in many areas of the United States. A mental health workforce that provides IADLs has not been developed, probably because Medicaid and Medicare generally do not allow reimbursement for mental health IADL services. Although some mental health programs (e.g., Assertive Community Treatment programs) do provide IADLs, such programs generally have a paternalistic overtone that may conflict with SDC, are expensive, and are not available on a sufficient scale to be useful for SDC participants. Programs that provide IADL skills training are similarly rare, though there are some examples of experimental programs.44 Thus, in mental health systems, there is no parallel to the workforce of home health care workers for persons with physical disabilities. Such a mental health IADL workforce might develop if SDC programs create a viable opportunity for these types of providers to enter the marketplace and provide services. SDC participants and coaches may benefit from education and guidance in relation to the process of shared decision-making. Shared decision-making refers to a process of health care delivery in which providers and clients collaborate to access relevant information and to enable client-centered selection of health care resources.23 Shared decision-making is a method of eliciting consumer treatment preferences, providing education about treatment options and related outcomes, allowing consumers to deliberate about the possible attributes and consequences of these options, and then supporting consumers' informed treatment choices. Shared decision-making has the potential to improve uptake of effective treatment options and participant satisfaction in SDC programs, by helping ensure that treatment decisions reflect participants' preferences, are arrived at systematically, and are informed by scientific evidence. In addition to general shared decision-making, targeted decision-making supports or training opportunities that are developed specifically for persons with SMI could be offered in SDC. For example, SDC programs could provide decision supports around identifying and addressing unmet service delivery needs. One example would be identifying the need for HIV and hepatitis prevention services. SDC programs could support risk assessment and could link participants with providers that offer convenient and free blood testing and hepatitis immunization. Technologies that allow for self-monitoring and self-report could also be used to support decision-making by routinely querying consumers about their preferences for services, their attendance at services, and the impact of those services.45 The Patient Assessment System (PAS), tested in several trials with individuals with SMI and shown to be feasible, reliable and to improve care quality, was designed with these purposes in mind.46, 47, 48 At PAS kiosks, questions regarding service needs and utilization appear on a touch screen monitor one at a time and are also read aloud by a recorded voice. PAS responses are summarized on a report that prints for the consumer and can be used to track goals, needs, service usage, and impact. The PAS can also print text to help the consumer advocate for needed services. A key purpose of the SDC approach is to increase consumers' control of decisions relating to their care, and thereby increase their independence and free them from coercion in mental health treatment. Although consumers' degree of involvement in decisions about their own treatment varies,23 many consumers experience mental health care as a coercive process, one which regularly forces them to adhere to interventions they may not believe are beneficial or do not want.22 Mental health providers, family members, police, and judges can also apply leverage to compel receipt of mental health treatment, and consumers' awareness of this leverage colors their perceptions of care.49 SDC programs give participants the authority to separate themselves from services that they do not find beneficial and to find new providers when they so choose, and this ability would be expected to result in less perceived coercion. Even with SDC, persons with mental health disabilities may remain vulnerable to coercion. One concern is SDC participants' choices regarding services and providers may be used by persons outside the program as a basis for coercion or competency challenges.34 Another concern is that persons who are more severely ill, who have not previously been offered the opportunity to direct their own care, or who have a conservator or representative payee will be vulnerable to pressure from providers, SDC coaches, or their representatives. Such concerns create a nexus of legal, ethical, and logistical issues, which may be resolved differently in different programs. However, in designing rules and procedures for their programs, program officials may need to balance the goal of protecting participants against coercion with other important program goals, such as maintaining program integrity and sustainability and ensuring participants' safety. In relation to maintaining program integrity and sustainability, some participants may need guidance to ensure that their spending priorities (i.e., the amounts of money being allocated to different categories of spending) purposefully reflect their health care needs. For example, persons who expect to have out-of-pocket expenses related to a frequent need for outpatient therapy should consider these expenses when planning their individual budgets. Although this guidance could come from a SDC coach, participants with more severe limitations in cognitive functioning have the assistance of a legally authorized representative, such as a conservator or representative payee. SDC programs should consequently be prepared to provide such representatives education about the SDC approach and to communicate their program's expectations around participant self-direction. Problems with coercion could also arise if fiscal intermediaries are not made accountable to the SDC program that they serve. For example, in Washington County, Maryland, the local mental health care services agency, which is an administrative branch of the state public mental health system, serves as the fiscal intermediary of the SDC program. Although this arrangement is thought to work well in Washington County, it could raise concern because the Washington County SDC program is accountable to the core services agency. This arrangement could result in a sense of coercion, because the SDC program may fear that its funding could be jeopardized if participants make too many requests for purchases. Protecting SDC participants from victimization by providers of services and other vendors should also be considered in the design of SDC programs. Certain behaviors, health problems, and other personal characteristics that are associated with having a SMI may increase participants' risk of being victimized. These would include illicit drug use and heavy alcohol use, impaired decision-making, low educational attainment, low self-efficacy, and poverty. SDC programs must be vigilant for and be prepared to respond to situations involving participant victimization, such as acts of financial fraud or theft, and also must monitor for unethical or unfair treatment by providers. Some SDC programs apply a vetting process to service providers, to check professional licensing and to run criminal background checks. This may help reduce outright fraud. However, SDC programs could also have procedures for administratively tracking and investigating cases of participant victimization and for designing response plans that reduce the likelihood of re-occurrences. 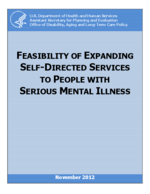 One potential concern regarding SDC participants' greater independence in making decisions about their own care and in planning mental health spending is that some participants may choose not to receive mental health services, may dramatically reduce their spending on outpatient specialty mental health care services, or may not reserve enough money in their budget for outpatient mental health services that they later need. Although reduced spending on outpatient mental health care may reflect a consumer's preferences, it could also result from misperceptions of one's own need for care. Although very little evidence is available to evaluate these concerns, such concerns may be shared by mental health providers, state authorities, and family members. According to one of the key informants for this report, it may be necessary to stipulate some minimum level of expenditure on outpatient mental health service use to reassure providers, state authorities, and family members. Such a stipulation exists in the Texas SDC program, wherein 60 percent of an individual's budget must be spent on traditional mental health services. Other programs (e.g., SDC in Washington County, Maryland) instead stipulate that continued participation in outpatient mental health treatment is a condition of enrollment in the SDC program, offer suggested formulas for spending a certain proportion of a participant's budget on traditional mental health services, or do not impose any rules around mental health service use. One key informant consulted for this report stated that the issue of people entering SDC and not using mental health services is "a 'red herring,' because it seldom happens." The same key informant pointed out that current public mental health system participants have the option of using no mental health care, and was not convinced that a rationale exists for having greater limitations placed on participants in SDC. However, one possible rationale for such limitations is that SDC may alter the social contract that underpins public mental health financing. When mental health care consumers in traditional public mental health systems do not utilize mental health care, they do not alter how public mental health financing is ultimately spent; all of the monies are spent on mental health care (for other consumers). In contrast, to the extent that SDC re-allocates public mental health care financing toward non-mental health goods and services (e.g., housing, transportation, or education), public monies spent on mental health care are reduced. This re-purposing of some public mental health financing suggests a reasonable rationale exists for establishing programmatic expectations around mental health service use by persons receiving public mental health financing for SDC. Whether or not programs impose rules around mental health service use, ongoing participation in some form of outpatient mental health treatment would seem to be an essential protection both for SDC participants and their programs. For participants, maintaining regular contact with a provider is necessary for the purpose of monitoring psychiatric symptoms and the side-effects of medications and for updating the treatment plan as service needs change. In addition, the public integrity and sustainability of SDC programs may be threatened if SDC participants do not continue in outpatient mental health treatment; the legitimacy of the individualized budget may be challenged if SDC participants do not allocate any part of their budget to traditional mental health care. Another potential risk to consumers in SDC programs concerns a sudden and unanticipated increase in need for outpatient mental health services, which could coincide, for example, with the onset of psychosis. Chronic mental illness is characterized by fluctuating symptoms and intermittent periods of acute crisis. A consumer's service needs could increase during the middle of a plan year and, at the time of increased service need, a consumer might not have sufficient funds left over in their individual budget to pay for needed outpatient services and medications. As a result, there is a potential risk that a consumer's access to needed outpatient mental health care would be adversely affected. In many traditional public mental health programs and in most mental health SDC pilot programs, risks associated with fluctuating need for services are pooled among all consumers in the program. While one consumer in the program may have an unanticipated increase in service need, another consumer may have an unanticipated decrease in service need. As a result, over the entire risk pool, individual variations in service need may be balanced out and the risks to individuals are minimized. Pooling a greater number of individuals tends to provide greater protection against financial risks, providing that systematic "adverse selection" of risks into the pool is not an important factor. The existence of relatively small and independently financed SDC programs raises the concern that any one program may not have a large enough risk pool to offset financial losses for some consumers with financial savings from others. Consequently, some form of pooling of financial risks across mental health SDC programs is desirable. One way this could be accomplished would be to roll mental health SDC programs under a single umbrella program that would be managed by a state's lead mental health agency or by a managed behavioral health care organization on behalf of a state. In that case, the state or the managed care organization would assume financial risk associated with over spending. A state could also stipulate other types of financial requirements for SDC programs. A state could, for example, require that SDC programs purchase insurance against participant over spending. The premiums collected would in essence be used to finance a large risk pool. Alternatively, a state could require that each SDC program maintain a reserve fund to cover unanticipated excess spending during the plan year. One of the rationales for the SDC approach is that giving participants the freedom to make choices, whether good or bad, encourages personal responsibility and independence. As a result, some participants in SDC may use individual budgets to select treatment interventions that psychiatrists and psychologists would consider misguided or potentially harmful. Others may spend their individual budgets in ways that they later regret. Although such outcomes are a predictable and perhaps necessary consequence of self-direction, SDC programs should seek to minimize them by offering education and decision-making supports. Ensuring that SDC participants obtain care that is no worse in quality than the care they would have received in traditional mental health programs and instituting standards that encourage quality improvement are critical to the long-term sustainability of mental health SDC. Quality and accountability have become guiding principles of efforts to improve mental health services and the health outcomes of individuals with SMI,21, 50 just as autonomy and choice are guiding principles in the design of SDC. One concern is that many participants will purchase ineffective or unneeded products and services or will be exploited by product and service vendors. Another concern is that SDC will undermine the successful dissemination of evidence-based practices (EBPs), mental health services and clinical practices whose clinical benefits have been demonstrated in rigorously designed research studies or demonstration trials (e.g., Supported Employment). If mental health SDC programs do not establish clear standards that address these concerns, their legitimacy may be challenged and sustained financing for SDC may be put at risk. In SDC, the pursuit of autonomy and choice could conflict with the pursuit of quality and accountability. SDC participants may or may not elect to use interventions and services that are supported by evidence and may select services that raise concerns among participants' health care providers or family members. The issue of quality may be addressed through a shared decision-making process and/or by providing decision-making supports, as discussed above (Section 4.2). SDC coaches, who assist SDC participants in developing their individual service plans, can be trained to provide information and guidance about providers and services and to support shared decision-making. Such training could include education on EBPs and information about the locations where EBPs are offered within a service region. Over time, SDC coaches may also compile a more global assessment of the quality of providers in their service region based on the feedback they receive from mental health consumers, and consequently SDC coaches may be able to provide qualitative assessments of provider quality to SDC participants. The concern that SDC programs could undermine the dissemination of EBPs raises several unresolved issues. One likely benefit of implementing SDC on a larger scale is that participants' service choices may yield new information about their preferences for various EBPs. Some EBPs may be preferred to similar non-EBP services, and in those cases SDC would likely accelerate EBP use and implementation. An evidence base is being developed for several innovative interventions that are recovery oriented, including stigma-reduction interventions,54 wellness recovery interventions,55 and peer-led illness self-management programs.56 Innovative recovery oriented interventions could be especially attractive to participants in SDC. Some SDC participants may report a mismatch between available EBPs and the types of services they would like to have available. Such information could result in modifications of existing EBPs or the development of new EBPs. The least attractive outcome would be if policymakers and providers favored the dissemination of an EBP that SDC participants did not want to use. In such cases, implementing a shared decision-making process to enable assessment of the costs and benefits of the EBP would be critical. One key informant to this report emphasized that it is essential for either the state or the managed care company or fiscal intermediary serving as the state's agent to ensure that information is available and that choices are made among a set of products, services, and providers that have been vetted for quality. According to this informant, allowing people to make choices from a selected menu of providers and services is a reasonable method to control quality. Whether or not programs limit choices among providers or services, programs should be able to communicate in an understandable way their policies regarding allowable services and products to participants, some of whom may have low literacy. Procedures and policies that SDC programs adopt in relation to participants' purchases may be interpreted as manifestations of programs' commitment, or lack thereof, to the principles of client self-direction and autonomy. Purchasing policies and procedures should consequently be transparent and ideally will reflect substantial input from SDC participants and other community stakeholder groups. However, purchasing procedures and policies may also be interpreted as manifestations of SDC programs' stewardship of public financing for mental health care. Viewed from this perspective, purchasing policies and procedures should reflect input from varied constituencies. Nearly all of the key informants interviewed for this report agreed that SDC participants should be allowed to purchase essentially any legally obtainable good or service that is consistent with one or more goals of their recovery plan. A former federal program official offered the following principle as guidance: programs should allow any purchases "related to living a full life in the community." However, at least one key informant pointed out that the legitimacy of some items could be questioned by the public even if the item is linked to a valid recovery goal, suggesting the need for some boundaries on purchases of non-traditional items. According to key informants who have worked in or with SDC programs, proposed purchases rarely have tested the boundaries of legitimacy and denials of proposed purchases have been uncommon. One SDC program administrator said that the most frequently disallowed items are requests to receive outpatient mental health services from a provider whose hourly rate is not affordable within the constraints of the participant's available budget. Insufficient linkage between a proposed purchase and a recovery goal in a participant's recovery plan was the only other reason cited for purchase denials. Standardization of approvable items and vendors, within a region or state, would seem to be in the interest of all SDC participants. Public controversy regarding the legitimacy of selected purchases in SDC could threaten the perceived legitimacy of the overall SDC program and continued program financing. External authorization of program policies regarding allowable purchases (e.g., as established in state regulations) and a process for auditing approved and actual purchases may encourage such standardization. SDC program coaches also will require training with respect to a program's purchasing policies. SDC programs could also utilize modern payment technologies to minimize labor expenses associated with managing participants' budgets. For example, SDC participants in Texas SDC are given "cash cards" that have a pre-assigned spending limit and that allow purchases from a pre-specified set of vendors. Such a system would relieve the need for human review and approval of each purchase and would facilitate the monitoring of participants' budgets during a plan year. In Cash and Counseling programs, fiscal intermediaries provide the Medicaid program with financial accountability and protection against misuse of budgets by participants and their representatives. Yet nearly all Cash and Counseling grantees report having experienced difficulties with fiscal intermediaries.57 Hence, state officials agree that it is critical to develop strong oversight capability to detect and resolve any difficulties in a timely fashion. According to key informants consulted for this report, most states and the Federal Government will only consider implementing SDC if it will not result in increased budgetary costs for mental health care. One key informant from the managed behavioral health care industry expressed a view that may be applicable to many mental health SDC programs: the costs of mental health care in SDC can normally be maintained at similar or lower levels as traditional managed behavioral health care systems, so long as appropriate administrative checks against excess spending are in place. Even so, the public budget implications of SDC should be a paramount consideration in the design of SDC programs. Mental health SDC program participants are exempted from many of the usual regulatory and managed care controls over spending on mental health care. This raises concern that some SDC participants may over spend their budgets, thereby creating a financial risk to the program. If participants believe that they are not financially liable for over spending their allotted budgets, they may be even more likely to over spend in the first place. Such an incentive for health care consumers to over spend when they are not financially liable for the costs of additional spending is known as "moral hazard." It is unclear who would be responsible for any financial losses due to over spending in SDC programs, should they occur. SDC programs may not have financial reserves or other financing available to cover such losses. Participants are unlikely themselves to bear financial risks from over spending. Medicaid is unlikely to cover such losses, either. As a result, the state government sponsoring the SDC program may turn out to be the payer of last resort for such losses. This suggests that the possibility of financial losses should be anticipated and planned for in any statewide implementation of SDC. Such contingency planning could result in additional financial oversight, a requirement for a reserve fund to cover losses, a requirement that programs purchase financial loss insurance, or other contingency plans. Although participants may be unlikely to themselves bear financial risks from over spending, participants' autonomy may suffer as a result of over spending. If participants spend their budgets too rapidly during the plan year, their program will be forced to ensure that sufficient resources are kept in reserve to pay for expenses during the remainder of the year. Programs would have to decide whether to permit continued spending on items being purchased from individual budgets, and could deny some purchases. Not allowing continued spending could be highly disruptive to a participant's recovery and, worse still, program administrators might feel compelled to direct the participant's future spending, thereby undermining the principle of self-direction. On the other hand, letting a participant continue spending beyond the allotted budget may set an undesirable precedent that could result in financial jeopardy to the program. Research studies comparing the costs of mental health SDC to the costs of traditional mental health care are scarce. Although there are a few reports of costs and expenditures in SDC, no studies have been conducted with sufficient methodological rigor to ensure reliable conclusions in relation to costs. Some key informants consulted for this report speculated that participation in SDC might result in lower spending on institutional care, whereas others speculated that consumers' health care expenses might increase when they begin self-directing their own care and have the freedom to choose services and providers they prefer. However, research studies to date provide little or no reliable evidence in relation to these issues. In relation to the narrower concern that some SDC participants will out spend their allowed budgets, none of the first generation of mental health SDC programs is reported to have had problems due to systematic over spending by participants. In SDC programs in Florida and Maryland, participants have not fully spent their individual budgets, on average, at least in some years,58 though it is not clear why they have not. Other programs' experience has been that participants fully spend their budgets. However, given that participants have few individual disincentives to spending, the systemic risks of over spending are likely to increase with the overall scale of SDC participation and with greater participant experience. Even if rigorous comparative cost evaluations of mental health SDC programs were available, the results of such analyses would not necessarily be generalizable to larger-scale implementations of SDC. How mental health SDC programs get implemented on a larger scale could dramatically affect their costs. Costs could vary especially depending on the specifications of staff training requirements and the administrative reporting requirements stipulated by states and by Medicaid. For example, programs that use peer-specialist providers may have additional supervision costs that programs using professional care managers do not have. One managed care executive also pointed out that implementation of SDC on a larger scale will require upfront investment to cover expenses for program staff, management information systems, and other overhead expenses while caseloads are accruing. Once a target caseload size is achieved, SDC programs would be expected to be self-sufficient. However, bridge funding may be needed during the start-up phase. Key informants to this report generally agreed that programs can apply various administrative procedures to manage participants' expenditures, though the effectiveness of these methods has not been demonstrated. One approach to managing participants' expenditures is to complete ongoing, regular (e.g., quarterly) administrative reviews of their spending patterns. If the pace of the participant's spending suggests the budget will run out before the end of the plan year, some purchases could be denied to bring participants' spending back into alignment with their budget. Although the notion of managing participants' utilization through a process of administrative review is conceptually at odds with the principle of self-direction, economic incentives created by SDC may make utilization review or some equivalent process unavoidable if SDC programs are implemented on a larger scale. In most existing mental health SDC programs, participants' budgets and spending patterns indeed are reviewed by an administrator at regular intervals, and any adjustments in spending are made on an individual basis. However, if SDC programs are implemented on a larger scale, such labor-intensive manual reviews of spending could become prohibitively expensive. Consequently, automation of budgetary review functions, using information systems supports and decision rules, is desirable. Programs could, for example, use an accounting system that maintains frequently updated information on claims, payments, and projected future spending to create regular reports on individual participant's spending and on spending at the program level. SDC programs could contract with fiscal intermediaries or managed care organization to provide capacities for administrative reviews of spending, as many of these organizations have management information systems, technical expertise, and administrative infrastructure needed to manage costs, and few states have these capacities. In fact, managed behavioral care organizations have already been partners in several mental health SDC programs. However, partnering with managed care organizations may require considerable advance and ongoing planning by SDC programs and their managed care partners, especially in relation to communicating to managedcare staff the purposes and principles of the SDC approach. SDC program administrators also may require training in accessing managed care organizations' information systems, to enter information and obtain reports. It seems likely that the costs of this training would be the responsibility of the state government, although perhaps other funding sources, such as Data Infrastructure Grants (from SAMHSA) could be used to cover these expenses. Another method that has been used to prevent cost increases following consumers' entry into SDC is indexing new participants' budgets to their level of spending on outpatient mental health care prior to entering SDC. Consumers with higher mental health expenditures prior to starting SDC receive higher budgetary allocations than consumers with lower expenditures prior to starting SDC. Indexing an individual's budget to prior spending may help ensure that the individual's spending in SDC will not exceed their spending in prior years. It is unclear whether this type of "risk adjustment" would generally work well in mental health SDC programs. Indexing implies, for example, that consumers who were inconsistently engaged in outpatient treatment prior to SDC get relatively smaller SDC budgets and consequently have less money available to them compared to consumers who were consistently engaged in outpatient treatment. Such an allocation formula may result in a gap between an individual's budget and the costs of their care for an individual whose needs increase substantially from one plan year to the next. Programs using indexing would consequently need some fiscal flexibility, perhaps a reserve fund, to be able to adjust during a plan year to unexpected changes in individuals' service needs.